I want to build an extension for Opera. Were should i start? The ideia is similar to Adblock Plus extension but for a diferent purpose. I have notice that Opera 27.0 is using a proxy for comunications. 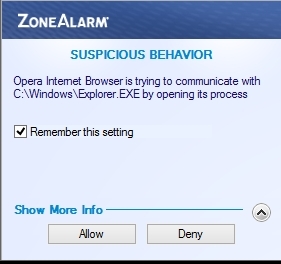 I have install ZoneAlarm Free and on the manual option it appear a lot of ZoneAlarm dialogues asking for permission to comunicate with explorer.exe from Opera. Is it normal or a anomally? In normal cases Opera shouldn't interact with EXPLORER.EXE and why does it open various processes in the same tree? In the past this indicates that malware were been injected in the main process making it possible for a trojan to comunicate to the server. I use Opera from when it was ad supported and with a possibility of buying the full version to remove the ads. Since then it has been my browser of choice. There is one feature that have been removed and i really like and it was the CTRL+Z to undo the last tab if you acidentally close the tab. I'm looking for Glype Proxies with hotlinking disabled for a project.